When I started homebrewing, I didn’t anticipate all the weird questions that would come to my mind. Learning about beer in general, the different flavors possible, and the ways you can play with the process to affect the final beer is amazing. My wife and kids think I’m crazy that I actually get excited about all the little things you can do to change your beer. This experiment was actually inspired by Andy Gibson, the president of the Menomonie Homebrewers. Many of the people in our club keg their beer and are all-grain brewers. He got me wondering if the act of bottle conditioning beer affected the flavor profile of the beer versus kegging. We decided to see if we could notice a difference. I’m picking up a discussion from when I first started this blog. Feel free to read Part 1, Part 2, Part 3, Part 4, or just keep reading and I’ll outline what we did. 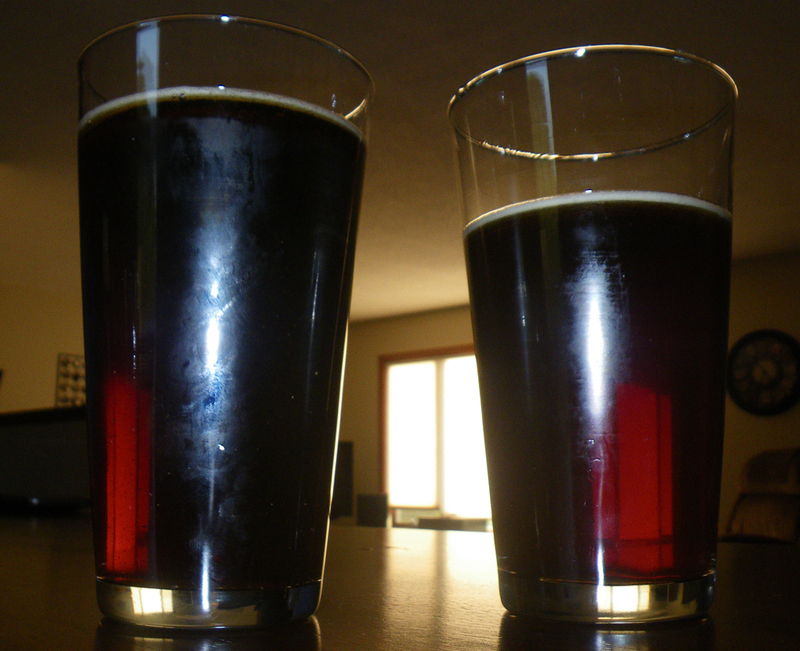 On May 5, 2012, a friend and I each brewed a five gallon batch of Janet’s Brown Ale from Brewing Classic Styles: 80 Winning Recipes Anyone Can Brew . We used the extract version of the recipe from the book. Brewing the beer was a great time, since it was part of our club’s Big Brew 2012 celebration. Both batches went into the same 15-gallon fermenter, fermented in a temperature-controlled freezer, dry hopped as one batch, and packaged the same day. On packaging day, five gallons was run off into a keg which was force carbonated and the rest was bottled in 22 ounce bottles using pale golden light dry malt extract as priming sugar. Due to allergies of some people I share my beer with, I always use DME rather than corn sugar to prime my beer. The entire packaging process took about two hours. Fast-forward to August 28. With all the crazy stuff that happened this summer, we never got the chance to do a side-by-side comparison until two days after my birthday. Andy and I got together at his house for the comparison. We noticed a difference in aroma right away. The kegged version had a subdued, yet firm hop aroma. It had dropped off quite a bit from where it had been earlier, but it was still present. However, in the bottle-conditioned version, there was basically no hop aroma. It had been replaced by a sweet, grainy malt aroma. It’s kind of hard to tell in the photo above, but the sample on the left is kegged version. The kegged version had small bits of hop debris present but was otherwise clear. Neither version had any haze present, but the bottled beer was brilliantly clear(thanks to a careful pour by me). There was quite a bit of sediment in the bottom of the bottle, due to the beer being agitated on packaging day, but it had settled out nicely. The difference in flavor was astounding. Like with the aroma, nearly all the hop character was gone in the bottle-conditioned version. There was a firm bitterness, but none of that delicious, citrusy flavor I remembered from earlier bottles of the beer. Malt and sweet grainy flavors dominated the flavor of the beer, fading into the bitterness. The kegged version still had that citrus character missing from the bottled version. As a result, the malt and grain flavors played a more background role in the kegged version, making the flavor start out predominately citrusy, fading into sweetness then displaying the firm bitterness of this beer. The packaging and carbonation technique used can dramatically impact the flavor of your beer. While there may have been differences in handling post-packaging, we seemed to find that kegging a beer can prolong the hop flavor and aroma of a beer when compared to bottle conditioning. We waited nearly six months before doing the side-by-side comparison. In an ideal world, it would have been fun to do a comparison every month and monitor the changes as they happen. Maybe there was a point where the bottle-conditioned version had more hop flavor. Have you tried a comparison like this? What were your results? Let me know in the comments and pass this article along to anyone you know who may have insight or curiosity about the topic.